My favorite apron so far, made while blaring Rammstein,and finished in record time. 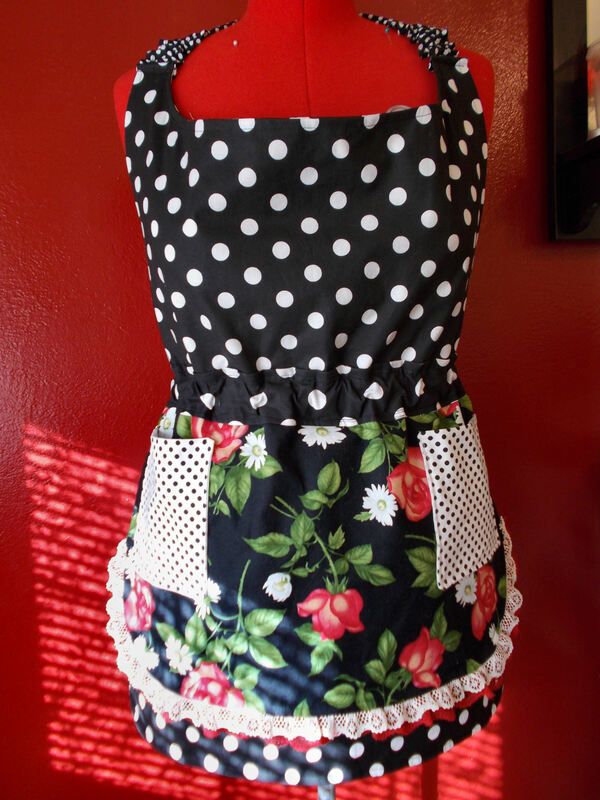 This apron is more me than any made before, black with white dot, with red roses and white daisies, it is trimmed in cream and red lace. Going to have a hard time letting go of this one. Ah roses is there anything more simple while still being so elegant? I fell in love with this rose fabric and it took a long time for me to cut into it, I’m very pleased with how it came out. Like all my apron this is fully lined. 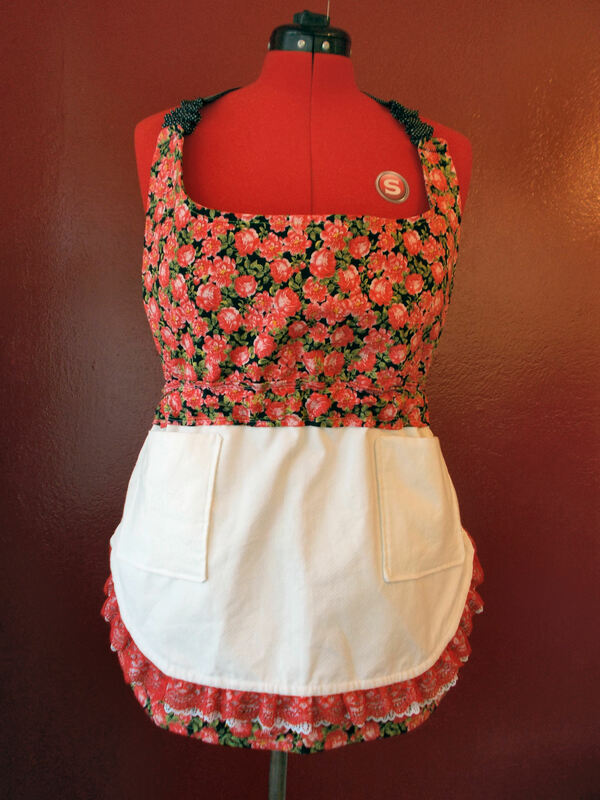 The attached half apron is white dot on white very subtle but I think it adds a lot. I am such a sucker for dots,I find them so sweet and simple. 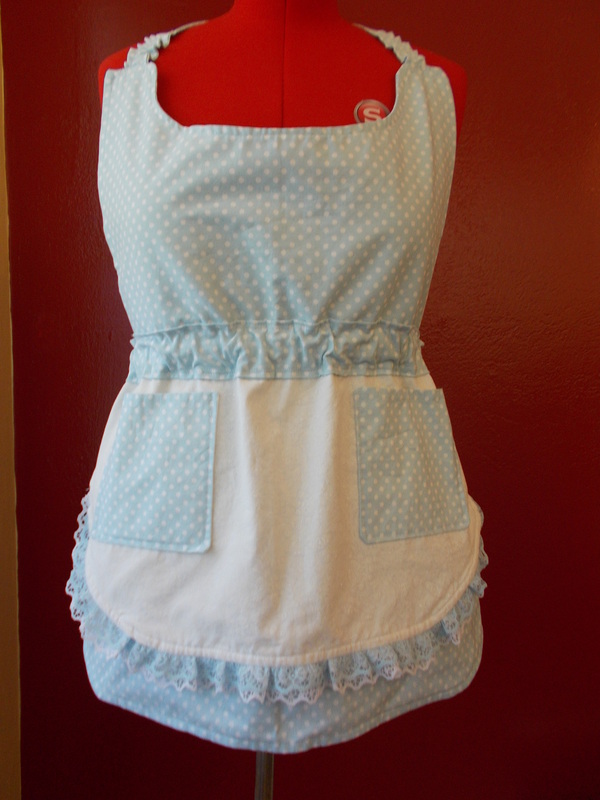 I made this baby blue with white dot apron, it, like all my aprons are fully lined. 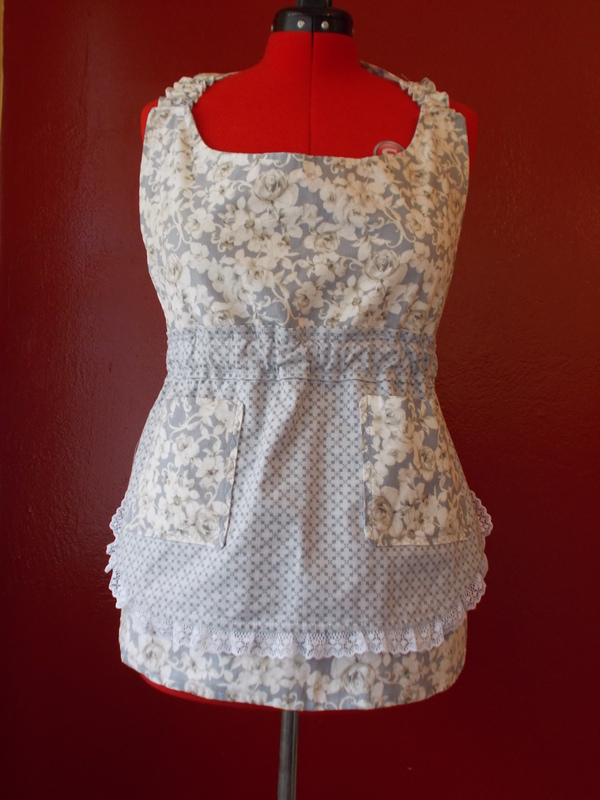 Its hard to tell but the fully lined attached half apron is white paisley. 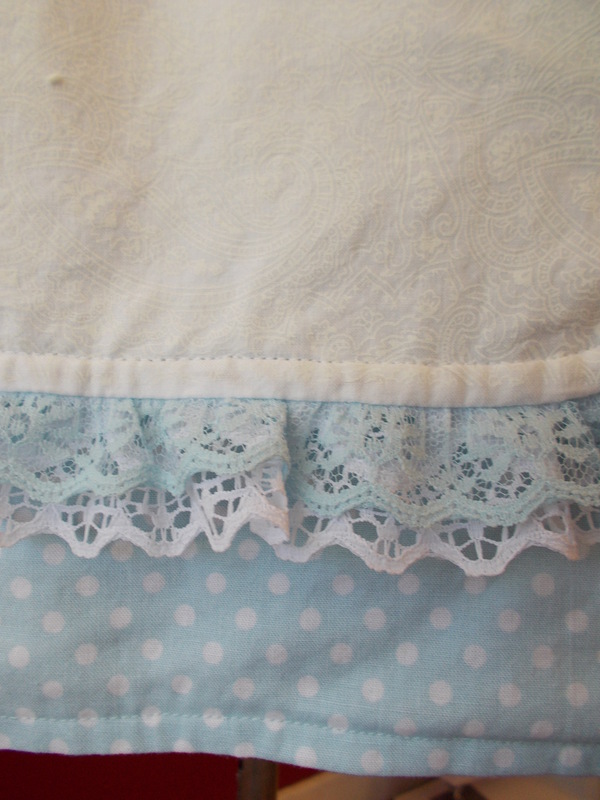 I added 2 layers of lace baby blue and white. I am a huge fan of they color grey, I think its entirely under appreciated, I found this cream rose on grey fabric, I really loved it but was afraid it was too old-timey, I paired it with this grey geometric pattern and i think it complemented it a lot. 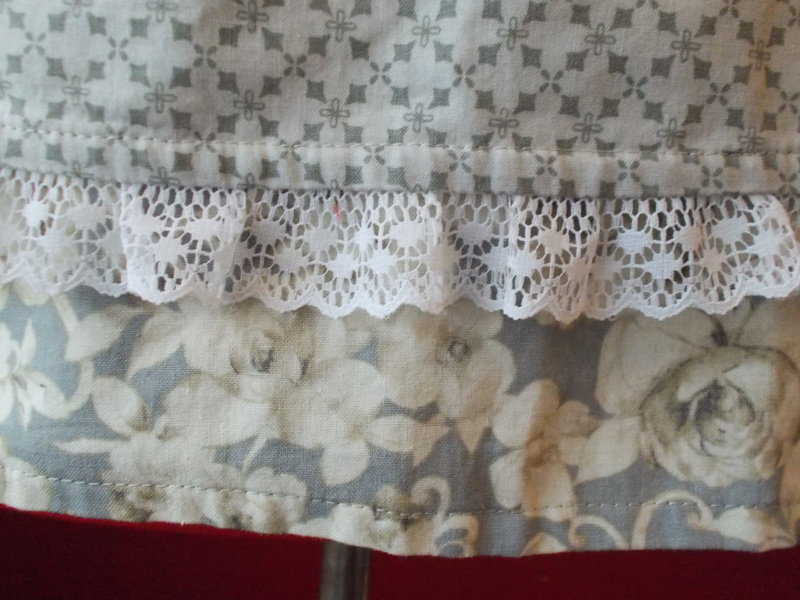 I added this white lace, I think the lace pattern ties the pattern from the two fabrics together. I made this short little apron with the cutest blue cherry blossom fabric, it has 2 hidden pockets, and baby blue and electric blue lace. I finally finished my first commissioned apron. 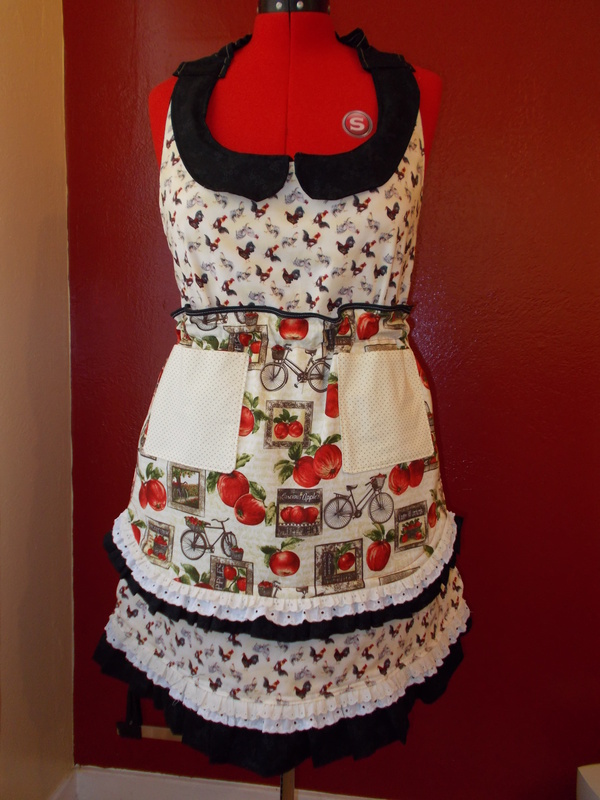 This is a fully reversible, 6 aprons in 1, and triple thick ,this is a heavy duty apron. 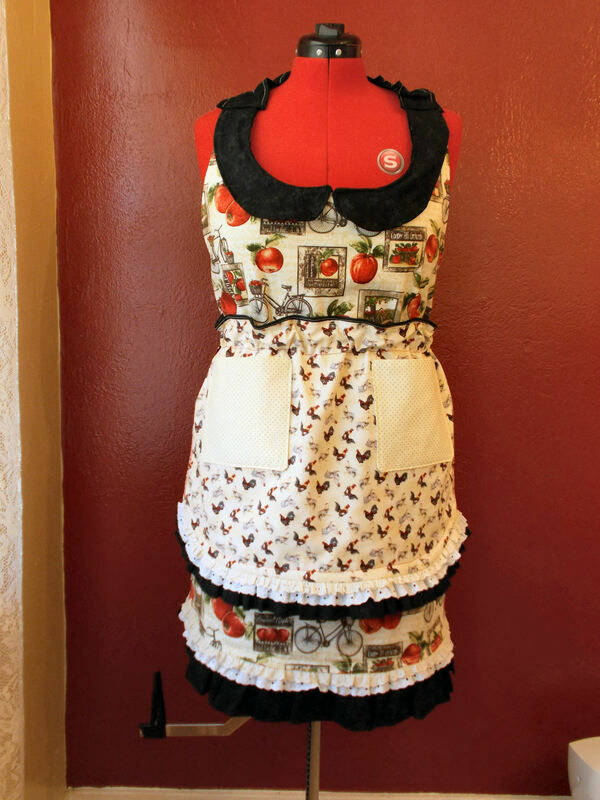 She really wanted an apple and rooster apron, after searching 6 fabric stores for the right apple I came across this gem. I never really wanted an apple fabric until now. I am actually thinking of making my self a dress with it. 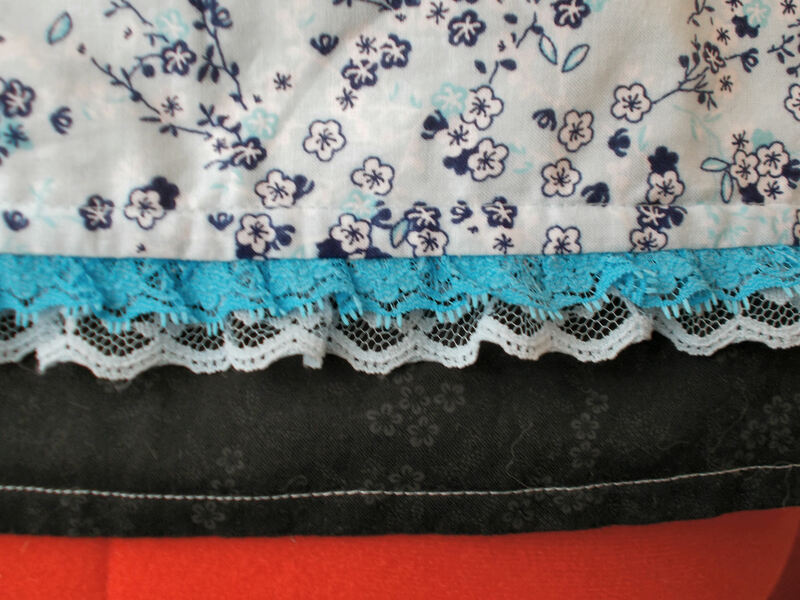 The pockets are copper metallic dot, and the black has tiny black apple blossoms that don’t really show on here. 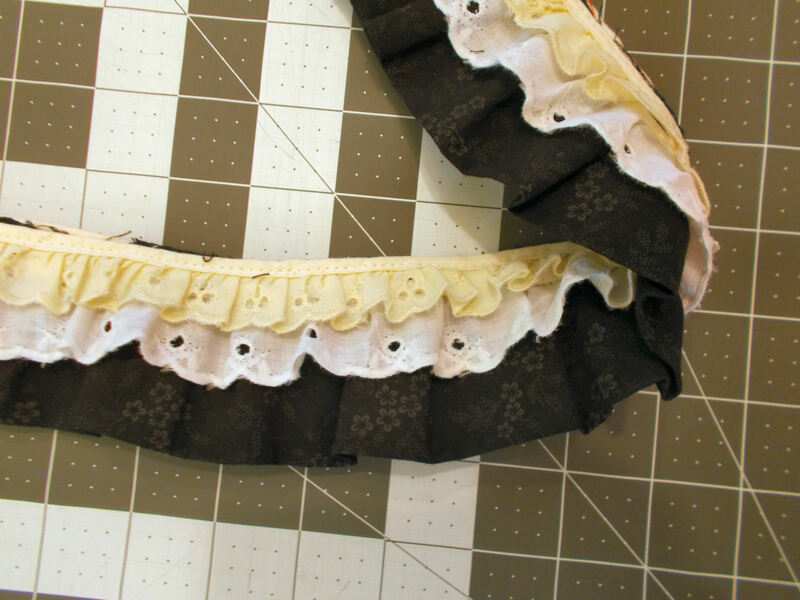 This was a lot of firsts for me, first making ruffles for a project, first collars ( free formed them I don’t even own a pattern with a collar) and first triple lined, all my others are dual layers. Took my 5 days in total. I have been gone way too long, my sewing machine decided to retire early with out notice. It took me 2 months but I purchased a new one. 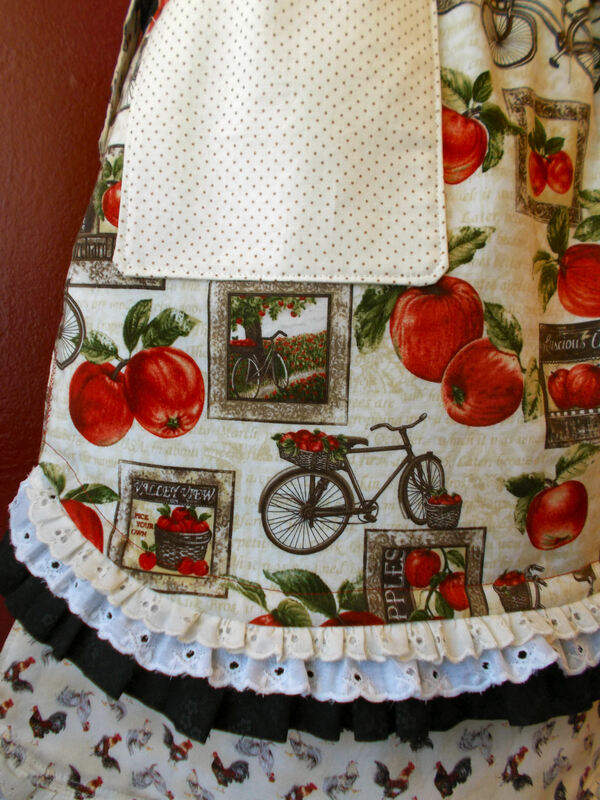 (I will post about my new machine soon) Right before my machines untimely departure i received an order for my first commissioned apron. 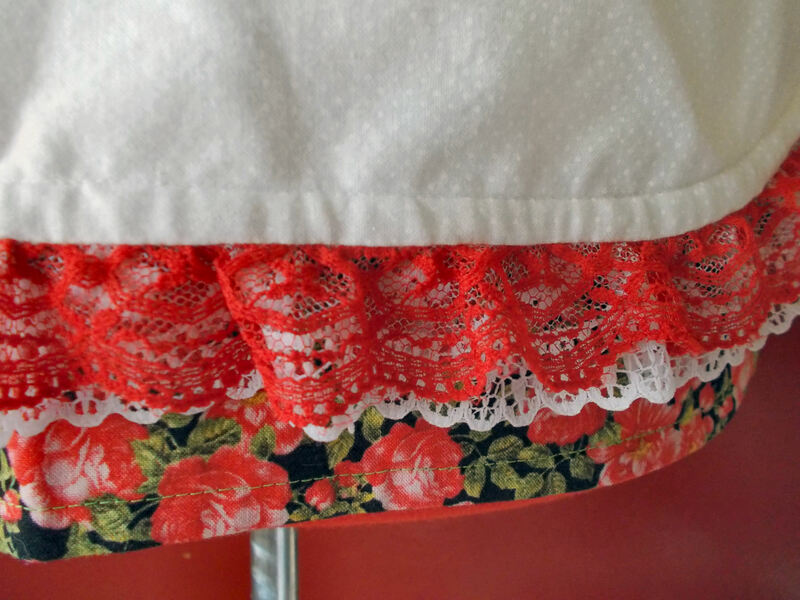 ( right after she purchased one from me ) she wanted lots of lace and ruffles on apple/rooster fabric. Now I hate making ruffles, I don’t have a ruffler foot nor am I experienced in gathering, but this is my third ruffle I have ever made, ruffled by hand, I think im getting pretty good at it. I cant wait to share more!